Uyuni is a common stop-off for travelers exploring South America, but public transfer can be a hassle. Travel from San Pedro de Atacama with ease via air-conditioned coach on a sightseeing transfer, benefiting from an early morning departure to absorb dawn views and skip daytime traffic. 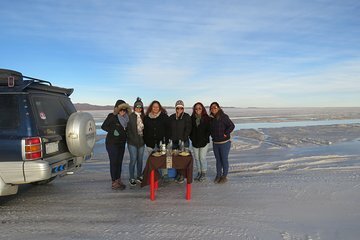 Forget the stress of finding your way in a new city, with included hotel transfer from Uyuni Bus Station. NOTA: The company is not responsible for delays due to inclement weather, loss of luggage, or any incident that is out of our responsibility, clarifying that we are only mediators for the purchase of tickets.